Bauman Endodontics: Don't put off your root canal! 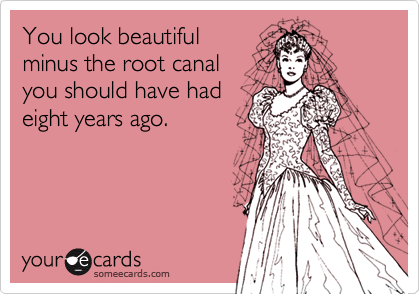 Don't put off your root canal! What is sedation or "sleep" dentistry? Lower molar with an extra mesial canal! How many canals are normal? Little Shop of Horrors clip! How does a microsope help with a root canal? I am Richard Bauman DMD MS and have been practicing Endodontics for three years in Salt Lake City. I completed an associateship last fall and have now opened my own office in Murray by Fashion Place Mall. I grew up here in Utah and loved all the fun and adventure in the area. I attended Highland High School before my parents moved where I graduated from Skyline High School having played a lot of soccer and running around as the mascot. After High school I served a church mission in Montreal Canada and attended and graduated from the University of Utah. I was then accepted to the University of Kentucky in Lexington for dental school, completed a general practice residency at the VA Medical Center in SLC and finished my endodontic education at the University of Louisville in Louisville Kentucky where I received both my endodontic certificate and master’s degree in oral biology. I am currently a board eligible member of the American Association of Endodontist as well and a member of the ADA and Utah Dental associations. I also work part time at the VA hospital working with their wonderful GPR program.